Despite the various conventions a dive watch must adhere to, the Zelos Mako manages to remain entirely unconventional. 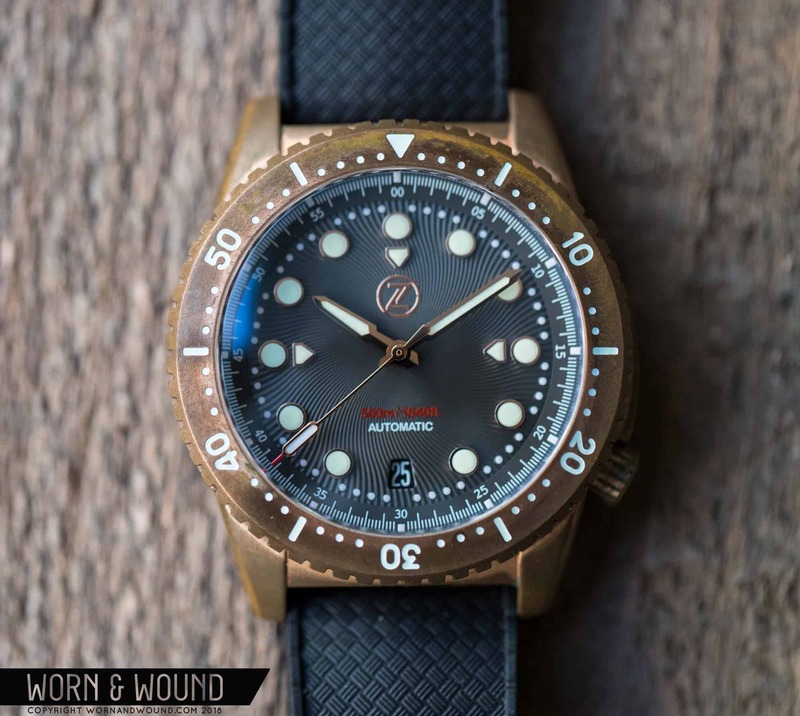 And it’s not just the bronze case and bezel that sets the Mako apart; it’s the fine-grain details—some barely legible at arm’s length—which integrate so well with the bronze, especially once it tarnishes. When I pulled the Mako out of the anti-oxidation pouch it ships in, the watch gleamed like polished gold. It looked disjointed, crammed, and overdone. The level of detail was remarkable—from the spiral engraved anthracite dial to the ultra-fine chapter ring markings and the lume-filled signed crown—but the watch just didn’t cohere. I was further confused by the Mako’s specs. Why ready a glistening 40-millimeter watch I’d consider wearing to a wedding for 500-meters of skull-crushing water depth? Why max out the legibility with green-tinted C3 and BGW9 lume? Why make this fancy thing so rugged that it invites abuse? I just didn’t get it. Then the Mako tarnished—really fast. Hiking around the enormous marvels at Storm King Sculpture Park in The Hudson Valley on a particularly hot and muggy day, I was drenched in sweat for hours. By 11 AM the bronze had dulled; by 2 PM I was seeing tinges of green, gray, and charcoal black; by the end of the day the Mako’s CUSN8 alloy had aged from Dressy Bronze into BADASS BRONZE. The Zelos Mako seemed to want to imitate the patina found on various alloys found at Storm King Sculpture Park. Now the anthracite dial looked Army green, its spiral engraving seeming to reach beyond the crystal onto the newly tarnished bezel and mid-case. Lovely shades of charcoal gray appeared on the multi-faceted lugs and pin buckle, perfectly integrating the black rubber strap. The polished gold hands and indicators with that greenish lume leapt off the dial with exceptional legibility, and the impeccable markings on the minute-track and quarter-second chapter ring came into sharp focus. Even the robust specs made more sense: the Mako wasn’t just rugged; it was begging me to abuse it, tarnish it, and make it mine. I’d heard so many marketing spiels about the unique, personal patina of bronze watches that I’d kind of dismissed the phenomenon. I’d read that no two would ever be the same, and I’d seen Instagram photos of crazy-looking turquoise Oris Divers Sixty-Fives and coal-colored Tudor Black Bays. What I hadn’t experienced, however, was the personal connection that emerges in tandem with the patina. This was my patina, wrought from my own body’s chemical output. Call me sentimental, but that chemical reaction was taking on full metaphorical meaning, every oxidized molecule intertwined with not only my body’s chemicals but also with my brain’s as I forged lasting memories. Watching the patina emerge was far more satisfying than expected. Oddly, though, one can wipe all that mnemonic patina clean with simple household stuff like ketchup and vinegar. I’m not sure what to make of the reversibility of bronze patina. Do you tell your kid they can start over when you hand it down? Do you wipe it clean on New Year’s Day as a symbol of your resolutions? Could a bad experience inspire you to dip it into vinegar and salt like some horological shaman performing an exorcism? For all I know, you need to protect a bronze watch when eating fries. I get that patina is all about impermanence, but what to make of impermanent patina? Of course, tarnished bronze isn’t the whole story of the Zelos Mako, as there’s much else to love about it. First of all, bronze is heavy, and I love a heavy watch. At just 40 millimeters across with a modest lug span of only 46 millimeters, the Mako enjoys significant gravitational pull without hogging a ton of real estate. At 16 millimeters thick to the top of the domed box sapphire crystal, the Mako stands up tall, yet proportions are excellent. Considered solely in terms of its size, the Mako breezily straddles the line between a dressy diver and a tool watch. The Mako is surprisingly elegant on the wrist. The Mako’s date window helps to secure its footing on the dressy side, and though I tend to prefer my dials without date, I think the Mako benefits from it. Here’s my reasoning: the date suggests that this watch is not just a diving tool, but a watch to be worn for any occasion where the date might be helpful—maybe at the office, while traveling, at an event, or just during daily wear. The Mako’s date aperture is a handsome trapezoid that sits at six o’clock, quietly adding a touch of sophistication. The Mako’s movement is a Sellita SW200, a unit found in many highly regarded watches. With 26 jewels, 38 hours of power reserve, and a rate of 28,000 bph, the Sellita SW200 is a increasingly popular stand-in for the ETA-2824. The case back lives up to the “Mako” name. Zelos naming this watch after the Mako shark seems perfect. Like the shark, the watch is small, ready for the most grueling of underwater stresses, and is uniquely beautiful. When rendered in steel with blue dial and bezel insert, the Mako watch takes on the iridescent look of the Mako shark. That shark-skin sheen persists on the bronze models to some degree, as well. There are number of compelling colorways to chose from—so compelling that they tend to sell out. The case back is steel, preferred here because bronze can discolor your skin. It sports a polished Mako shark in relief against bead-blasted steel with modest engraving, including individual serial numbers. This is one of the better looking case backs I’ve recently come across. The crown is a little on the small side. It looks great, but it’s a bit finicky to screw in and out. On the upside, once the crown is secured within its curved guard, it would take something I can’t even think of to accidentally unscrew or damage it. Threads are buttery smooth, and the crown’s signature is filled with lume for an unexpected—and I suppose useful—pop in the dark. My only other objection is that both the red second-hand tip and the red water resistance text are illegible against the anthracite dial. As much as a little red text on a dive watch can make me swoon, I’d probably have preferred something more legible on this specific dial. This one is for all of the lume lovers out there. The Mako ships in a wooden box with a watch roll, a strap-changing tool, both a rubber strap and a brown leather one, and, lastly, a perforated metal warranty card. This packaging is serious kit, and I’d recommend the Mako as a gift for just about anyone, diver or otherwise.